A very special and meaningful order to us. Preeti, the girl friend commissioned me a set of black and white fashion themed cupcakes for her loved one simply to cheer him up few months back and now it's her boy friend's birthday, she asked for something special and unique, a 3D fondant cake this time. I tried to find out what her boy friend liked or dreamed of and she finally made a decision to make him a Yamaha R6 motorbike. 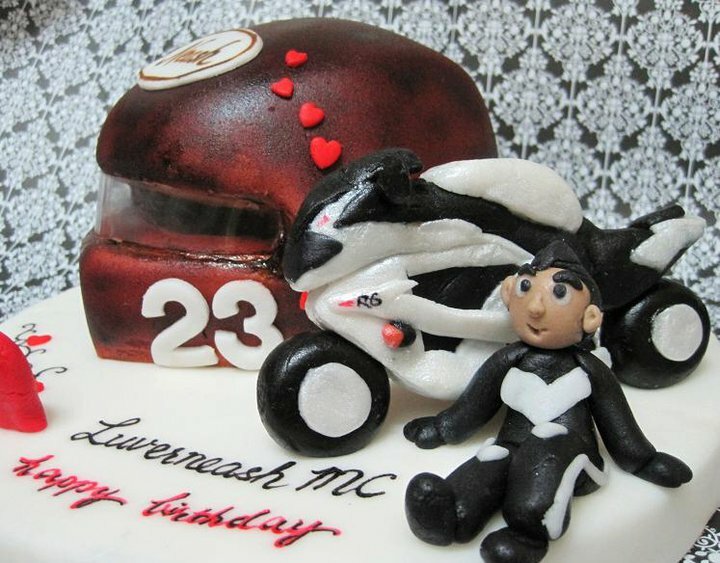 I suggested her to add a 3D helmet cake and a figurine of the birthday guy, Neash in biker's suit. She was more than happy to accept it. This was the challenge I had to face if I were to strive towards my dream of being a professional sugar artist. Yes, I know and eventually I came out with the final product as above. Though not perfect, I was quite happy with it. Preeti had been giving me the timely encouragement and confidence before the cake was sent out. I'm really thankful for her trust and kindness. You're most welcomed, Preeti. Your trust has driven me to move a step further towards my dream. :) Thanks.